“I have been reading steadily for seventeen years; when I go down I want to start writing”. 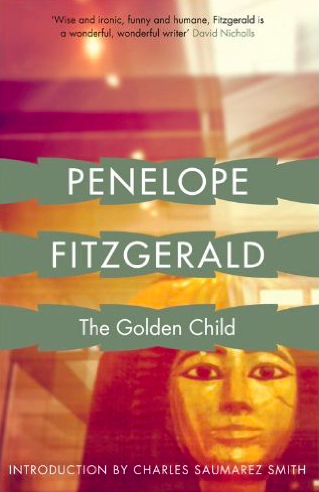 What Penelope Fitzgerald, quoted in the pages of Oxford University’s Isis magazine in 1938, meant here, was that when she left with her degree – as she would that summer – she was going to become a novelist. Part of the second generation of women allowed to go to Oxford, Fitzgerald graduated in English Literature with a First and something called a ‘congratulatory viva’, which is when your tutors, rather than make you argue your case, just tell you how brilliant you are. If she wanted to be a writer, she couldn’t have had a better start. Yet she published her first novel at sixty-one, and wrote her eventual masterpiece at eighty. This might seem an unthinkable fate, and an unbearable wait, to some of us modern writers – but it didn’t turn out to matter. I think she’s still the greatest British novelist of the 20th century. December 16th 2016 was her centenary and she remains puzzlingly overlooked; I’d like to redress that. These days, how many of us expect a short, direct line from anonymity to success? Write well, and hard, make friends with the right people, and things shouldn’t take too long, right? Maybe this was what Fitzgerald felt when she graduated in 1938, Oxford’s golden girl with her First in English who was going to be a great writer. What fascinates me is that it took her forty years – or life took forty years of denying her – before she got that chance, and yet that gap seems only to have served her well. This should perhaps be a salutary lesson, but maybe things were just different then. As soon as Fitzgerald graduated, the Second World War threw ordered lives and steady trajectories into chaos. She had all the intellectual advantages it might have been possible to have – she’d followed her mother’s footsteps to Oxford, her father edited Punch magazine, her uncles were respected clergy (one of whom, Ronnie Knox, Evelyn Waugh wrote a biography of), and she lived in infamously literary Hampstead. But her mother, to whom she was very close, had died of cancer not long before. Then, some of her best friends died in the war, and her brother disappeared for three years – they eventually found out he’d been a POW in Japan. Desmond Fitzgerald, the man she married in 1942, was a promising barrister, but he was sent off to be a major in the First Battalion of the Irish Guards, which saw only 326 men out of 926 return – one of the worst casualty rates in all the fighting. Desmond was one of the many post-war sufferers of shellshock. (So was her brother, who had a nervous breakdown but never spoke of his experiences as a POW). In Fitzgerald’s biography, Hermione Lee says, “Desmond had been profoundly changed by the war, and came back a different person from the dashing young officer Penelope had married in 1942. He had seen appalling things and lost many men; he had killed a large number of people. He would wake up in the night, screaming.” Even so, like so many men in his position, on returning home from the war he was expected to slip back into normality. Instead, normality slid away from him. He drank too much, was humiliatingly dismissed from the Bar for stealing money from his Chambers, and the family, with three children, tumbled from middle-class Hampstead towards near-destitution. They first moved to Southwold, on the Sussex coast, and then, because they couldn’t afford anywhere else, onto a leaky barge on the Thames. When that sank, they were homeless. They were put into a shelter – Desmond was absent at this point – and eventually moved into a council estate in South London. Fitzgerald worked as a schoolteacher in order to support her family, whilst Desmond held down a low-level clerical job at Lunn Polly. This is not a squalid fate, and to suggest so would be problematic, but Penelope felt it to be drudgery, and far from the life she had envisioned for herself. In a notebook from the late ‘60s, she writes: “I’ve come to see art as the most important thing but not to regret I haven’t spent my life on it.” It’s a lament for what could have been, and what she wanted so dearly – but she wasn’t going to pity herself. She remained a teacher for twenty-six years, until she was seventy years old. However, things were slowly changing. In her fifties, she began to research a book on the pre-Raphaelite artist Edward Burne-Jones. She presented it to her family as a hobby, or therapy – to ‘stop her going mad’. It took five years, and was a sign: the dam had burst. Immediately after, she wrote another biography, this time of her father and three uncles (called The Knox Brothers), and submitted a story to a Times ghost story competition, which was shortlisted and published – her first piece of published fiction for over twenty years. Finally, she began work on a novel. Then Desmond died. The novel, The Golden Child, came out the following year. At sixty-one, she was a debut novelist. After this, Fitzgerald just got on with it. The following year, she published The Bookshop, a short, sad and thoughtful novel about a woman who opens a bookshop in Hardingham, a fictional stand-in for Southwold. It was shortlisted for the Booker Prize. Upon hearing this, Fitzgerald said it must be a mistake. The year after that, in 1979, she published Offshore, based on her life aboard her sinking Thames barge. There’s an estranged husband, two young daughters running wild around London, and a self-effacing heroine who is not to be underestimated. It won the Booker. I have to admit that, like Frank Kermode (one of her favourite critics), I prefer The Bookshop – he wrote: “Offshore, though admirable, strikes me as decidedly inferior to The Bookshop. The earlier book was defter, more resonant and more complete” – but it’s still a wonderful novel. The media, for the most part, treated Fitzgerald’s Booker win like an abherration, as though she were a dotty grandmother who had somehow found herself in entirely the wrong place. But it suited Fitzgerald to be seen like this. She told reporters that with the £10,000 prize money, she was going to buy a typewriter and an iron. In fact, she went to New York. After her Booker win, not wanting to be alone and with nowhere permanent to live, she moved around the country to be close to her daughters and their families. During this time, she decided it was time to stop writing fiction based on her own experiences. The four novels that followed, published from 1986 to 1995, are four of the best in the modern English canon. The first, Innocence (1986), was also the first Fitzgerald novel I read, and a good place to start. It’s about a sixteenth-century Italian noble family, the Ridolfis, and their cash-strapped twentieth-century heirs, one of whom, the well-meaning Ciara – surely the story’s innocent – falls in love with Salvatore, a difficult, emotional doctor, who amazes himself by reciprocating entirely. The novel is about love and hope, innocence and (of course) experience. It’s also about vigorous pursuit of life versus stubborn decaying passivity; and how in either case it might just slip through your fingers, or surprise you. It’s a brilliant evocation of post-war Italy – decrepit Florentine villas, olive groves and lemon trees, crops of hay, Fiat cars and English cigarettes. 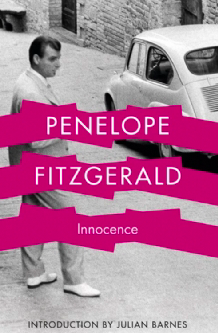 Innocence shows Fitzgerald’s growing mastery of narrative. I imagine her in a cutting room, with reels of footage about her characters, sizing up what’s necessary. She has so much information, but knows that only a bit of it needs to be shown. She pinpoints what matters, knowing each word (or, to keep that cinematic metaphor, each detail in each shot) must count. It must add texture, depth, and context. If not, forget it. What emerges from this is an elliptical text with a profound intelligence; proof that in order to tell everything, not everything needs to be said. The Beginning of Spring is also a novel about coping. When Frank’s life falls apart – as it surely would if your wife leaves without telling you why, or where she’s gone – he is stoical. As Fitzgerald says, she is interested in “a sort of noble absurdity in carrying on in unlikely circumstances”. Frank does his best for his children, keeps his business going, immediately falls in love with someone else, too, but life is complicated and unpredictable – even a man who loves his absent wife might be stirred in other directions. Indeed, maybe falling in love with someone else is a form of coping. It’s how you might cope with the pain of loss – you might sublimate it, at least for a while. 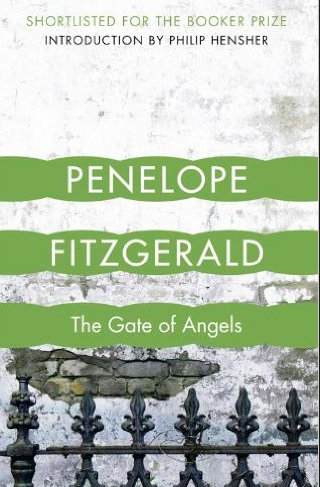 Both The Beginning of Spring and Fitzgerald’s next novel, The Gate of Angels, are set just before World War I and the Russian Revolution – she was drawn to moments just before a great change. I wonder if this has anything at all to do with her own experience of emerging from the prelapsarian brilliance of Oxford into World War II, but that said, the rupture of continuity is always interesting. The Beginning of Spring was Fitzgerald’s favourite of her novels, and it’s mine, too. 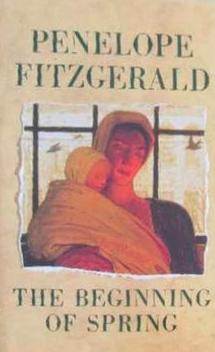 The Gate of Angels (1990), set in Cambridge around 1910, came next, when Fitzgerald was 74 years old. Her uncle Dillwyn (a Bletchley codebreaker) was at Cambridge then and she knew that its atmosphere, as he had conveyed it to her, would be juicy enough for a novel. It explores both a breakthrough in physics – the discovery of the atomic nucleus – and the history of medicine. As ever, there’s a love story running through it – and as ever, the falling in love happens quickly, between very likeable characters. For all Fitzgerald’s clear-eyed unsentimentality, falling in love was, to her, endlessly fertile ground. She is wonderful on its maddening irrationality, the pain of its frustrations and the purity of its joys. 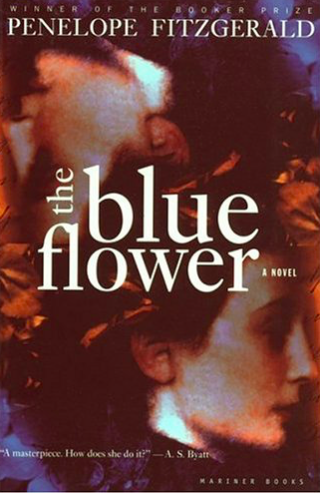 The Blue Flower, set in eighteenth-century Germany, is about the Romantic philosopher Novalis, in whom Fitzgerald had long been interested. The ‘blue flower’ comes from Novalis’ novel fragment Heinrich von Ofterdingen (1800), which is a poetic, mystical search for this flower – an unattainable object – and a symbol therefore of yearning, passion and transcendence. Novalis, or Fritz, as he’s mostly called in Fitzgerald’s novel, is a generous, garrulous, wide-eyed genius. At twenty-two he falls in love, as Novalis did in real life, with twelve-year-old Sophie, who is a bit dim (though he calls her ‘My Philosophy! My Wisdom!’). Despite her age, and the slightly less pressing problem of her being unable to remember his last name, Sophie accepts the integrity of Fritz’ affection. Fritz waits for her to come of age, develops his ideas, manages the salt mines of Saxony (the family business) and obliviously, and very sadly, breaks somebody else’s heart. All of this is told in fragments that move through time with the minimum of explanation or context. It’s like following a dream – and as you keep up, you’re swept away. As ever, almost all the characters are sympathetic – a hard thing for a writer to do well, never mind brilliantly. The Blue Flower is a culmination of the forms of craft Fitzgerald was practicing in previous novels; the fragmented perfection of Innocence, the comedy and sadness of The Beginning of Spring, the balance of density and light of The Gate of Angels. She died in 2000, aged 83, one of the great writers of the twentieth century. I don’t want the lesson to be taken away from her life that you can triumph in the end. Her writing tells so many better stories. She is interested in – and she wants us to care about – the vulnerable, the defeated, the forgotten and the quiet. She explores lives of frustrated passion, stubborn idealism, idiotic love, hopeful love, hope in general (there is so much hope in her novels), failure, quiet courage, kindness, and moments when the tragic and the comic overlap. Her imagination might have been especially fired up by Italy, Russia and Germany, but she declared herself a typically English novelist because “most English people think life is not important enough to be tragic and too serious to be comic”. What she looked for in other writers was “the quality of pity and kindness. I don’t see how this world is to be managed if we don’t pity each other.” This wasn’t a patronising kind of pity. In line with her Christian faith, it was – as she said – a form of kindness. It is a plea for sympathy, for courage and for understanding. In The Bookshop, she famously divides the world into ‘exterminators’ and ‘exterminatees’ – and her characters, the ones we root for, are always the latter. They are courageous and good and hopeful, but they are outsiders, too: marginalised, defeated by circumstance, failing through no fault of their own. But they are written, always, with tenderness. Perhaps, then, that’s Fitzgerald’s real legacy: her empathy for these exterminatees, her kindness. Posted in Essays & features and tagged minor writing, Penelope Fitzgerald. Bookmark the permalink.